Headingley sits about 6-kilometers west of Winnipeg and with the scenic Assiniboine River flowing straight through the community. The rural municipality in Manitoba province is not to be confused with the suburb of Headingley in Leeds, England, though this location was the origin of its name! Even if you made the mistake of confusing the two, their different climates would give their positions away pretty quickly. The continental climate of Headingley, Canada can be much harsher than the oceanic climate of Headingley England in multiple seasons. Residents of Headingley know the positives and negatives of a continental climate. Positive: perfect swimming weather in the summer and cold enough for snow recreation in the winter. Negative: dips and spikes in temperature that can have HVAC equipment on the fritz quick. Luckily, there is no reason to worry if you live in Headingley- Provincial Heating & Cooling is in the area and ready to tackle your heating and cooling problems! Our factory technicians arm themselves with the highest quality equipment and professional techniques on every job. 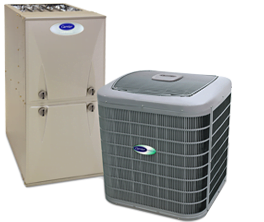 Provincial Heating & Cooling is a Carrier Factory Authorized Dealer for the world-class Carrier products, meaning we will always recommend the best of the best to our customers. As an Authorized Dealer, you can have peace of mind knowing trained experts are handling your equipment. We have upheld rigorous standards to obtain this title and continue to do so for the benefit of our customer’s homes and business. Provincial Heating & Cooling has been providing exceptional services in Winnipeg’s heating and cooling industry for over 21 years. We offer repair and install options for both residential and commercial properties, using environmentally friendly techniques. For those customers looking for yearly preventative maintenance, Provincial Heating & Cooling extends a comprehensive Pro Service Plan. This plan includes priority services, 24hr availability, and a 100% Satisfaction Guarantee. You can schedule a free estimate of your property online or call us today with any questions regarding our products and services. There may be some Headingley summers too hot or cold to bare any outdoor activities. At least with the help of Provincial Heating & Cooling, your indoor space can always be the comfortable setting you desire, no matter what the weather is like outside! I would like to send my appreciation to Robert at Provincial Heating & Cooling for offering at true 24 hour service. Our water heater decided to leak Christmas morning and with Family and guests visiting, no hot water was no option. I called your company’s phone number and reached Michael, one of your techs, he was professional in every area, and we had hot water in less then two hours. I will recommend your company to all my friends and neighbors. Great service and Merry belated Christmas. Thank you.